A video of a crashing plane in Nasugbu, Batangas had caught the attention of netizens after it was posted on Facebook on February 1, 2015. It had gone viral and already gathered more than 1500 views in just an hour. There was a crowd enjoying themselves with an aerial show. Some voices were heard excitedly saying that there were a couple of planes but soon the shout of glee was turned into shouts of horror after the plane crashed into the sea. 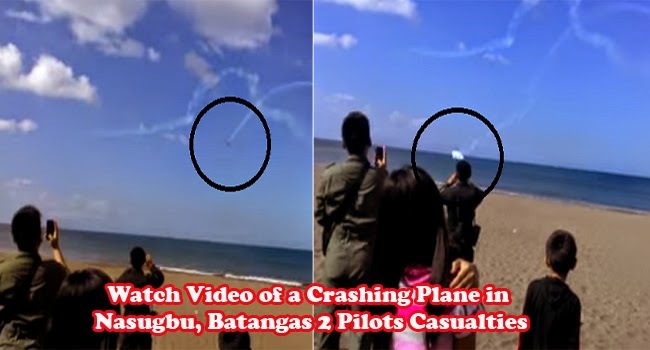 It seemed that the clip was the same incident reported which claimed the lives of two Philippine Air Force pilots last January 31,2015 during an exhibition. According to Pablo Aguda, Nasugbu Police Chief, the plane was part of the team that was suppose to do an aerial exhibition for the celebration of the 70th Liberation Day of Nasugbu. As reported by Manila Times, at around 9:45am, the SF-260 plane had crashed just off the shore of Barangay Bucana. Col. Rico Canaya, spokeperson of PAF, said that the cause of the incident is still yet to be identified. The two pilots were identified as Captain John Bayao with his co-pilot 1st Lt Nazaer Jana. The plane, SF260FH No.1034 took off from Fernando Air Base in Lipa City at around 9:07 with the other three planes. After the incident, search and rescue operation had been immediately deployed including helicopters from Villamor Air Base in Pasay City. After a few hours, the bodies of the two pilots were recovered as reported by Philippine Star. PAF had created an investigative team to identify the cause of the crash. The names of the two pilots had been initially withheld to tell the bereaved family about the fate of the two pilots.